Hi everyone! I hope you've all had a splendid Thanksgiving, enjoyed with family and friends, and all the turkey you can eat! 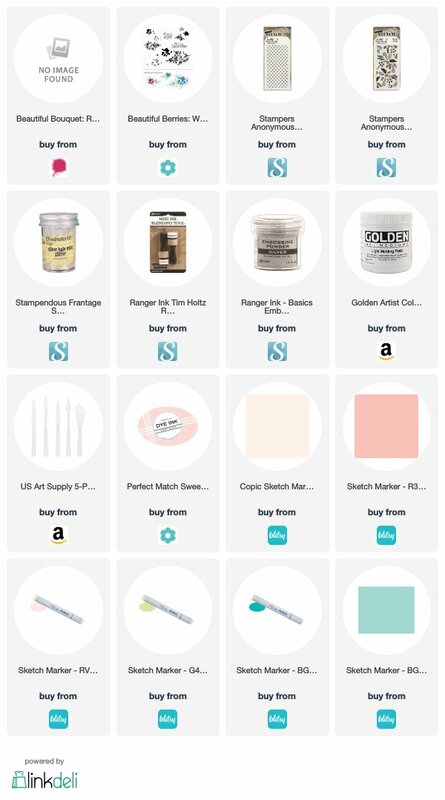 Even though North of the border, our Thanksgiving tradition falls a lot earlier, we still partake in one of the biggest shopping days of the year, so I've compiled below a little list (it was hard, but I narrowed it down to ONLY 4 shoppes) of my favorite BFS happening through the weekend! 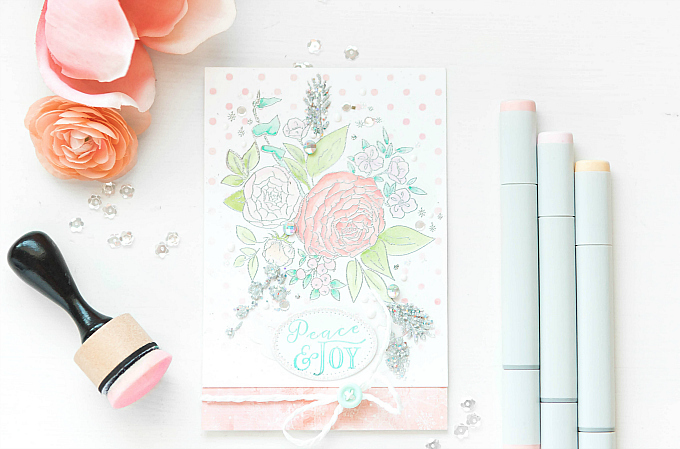 And I'm sure, just like me, after all the shopping frenzy, you might need some peace and quiet in your life, and what better than some alone time with Copics and this Beautiful Bouquet floral stamp! I also thought it would be fun to start a new card series on the blog: Delicate. I've been straying a little from this style. So this is my way of getting back to it and sharing a few soft + feminine cards with you all. 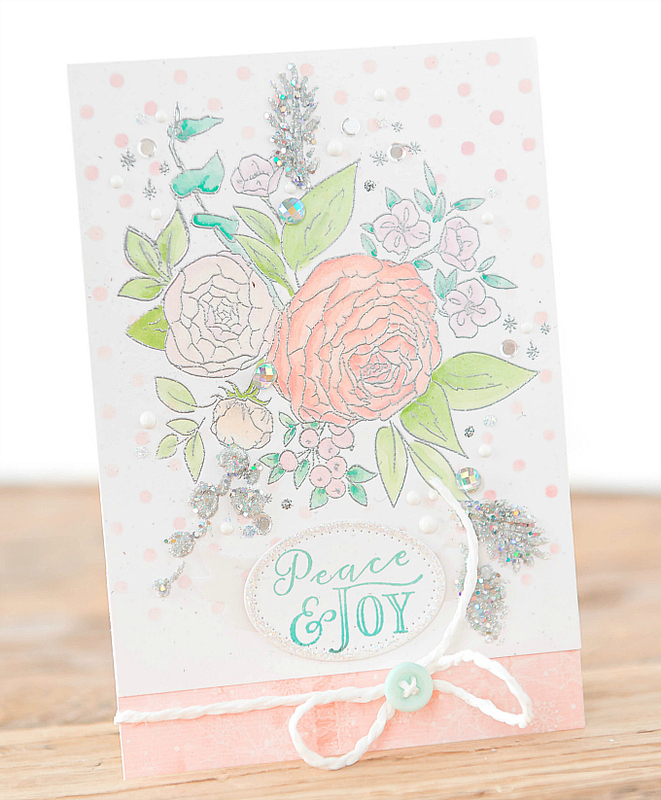 To start this card, I first stamped the beautiful floral and embossed it in silver. I knew I would eventually add silver glittered accents, so I turned the flower up-side down to allow room for two accents at the bottom. After stamping and embossing, I used a polka-dot stencil to ink up some bitty pink dots, using PTI's Sweet Blush ink. I used beautiful soft pink and peach hues to color in my flowers and greens and blues for the leaves. I love that Copics are so easy to blend, even without a blender marker, and how soft some of the hues are. It makes blending, shading and coloring so fun! At the bottom of the card, I added a peachy stripe of paper, a string bow and a little oval sentiment using PTI's Winter Berries stamp. 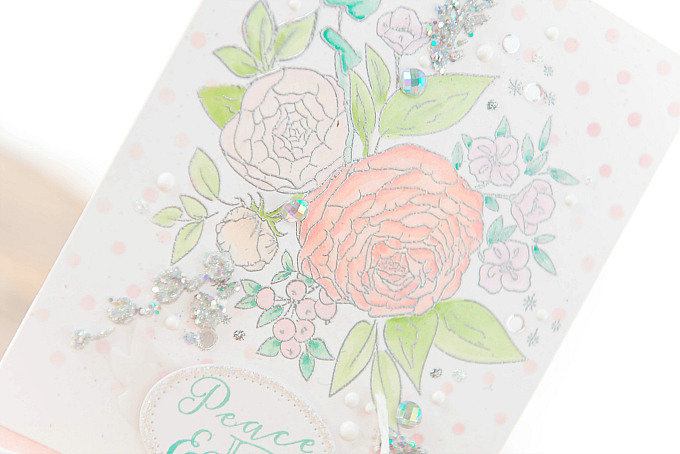 If you look closely, you'll see that the oval is speckled with glitter along the edges, and that the sentiment is stamped in ombre shades of Aqua Mist and Ocean Tides. 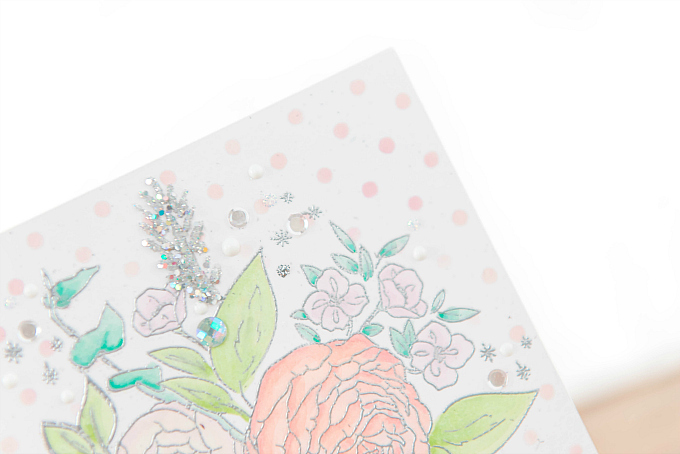 I also added a few sequins, rhinestones and Nuvo drops around the card, and used my Festive Tim Holtz stencil to add a few springs of holly and evergreen with some molding paste, followed by my favorite Silver Halo Mix Glitter, which surprisingly holds really well. And as always, if something from today's card catches your eye, why not give it a try! Wishing you all a sparkle-filled day! Thanks so much for visiting! This is soft and dreamy Ivana! 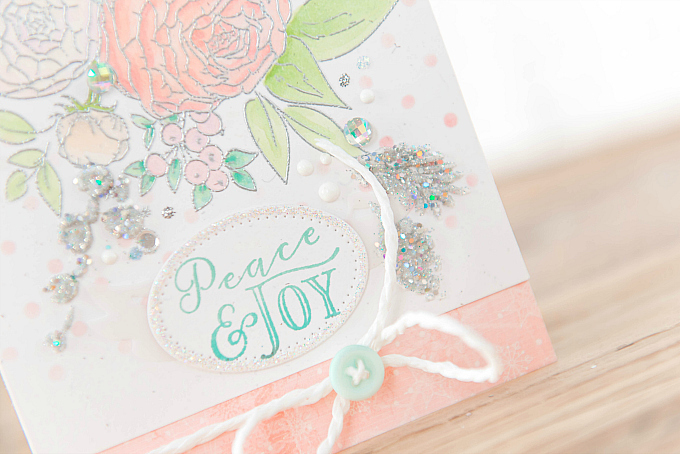 I like the embossing and the little bits of sparkle! Thank you so much, Lisa! :) Hope your Holiday-ing is off to a wonderful start! I'm so glad you're doing this series, Ivana! Soft & feminine is one of my favorite styles & you're such a pro! 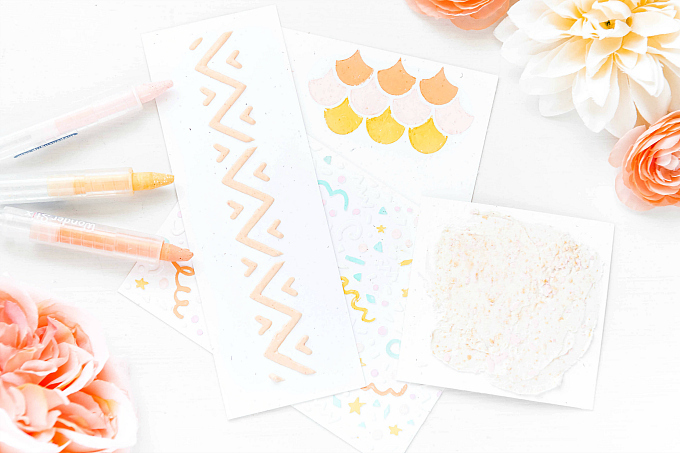 I love the bouquet stamp & your coloring! My Copics are mostly used to color pearls--haha! Hoping this year to try & use them a bit more. You're an inspiration!